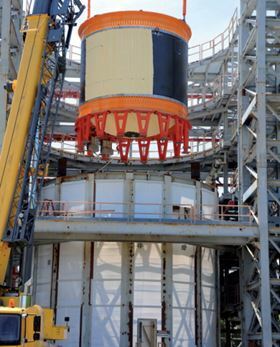 Composite cryogenic tanks are being specified for a number of rockets including NASA's own new heavy-lift Space Launch System. The Space Ship 2 for the Virgin Galactic space tourism venture. The ability of autoclaves to impart closely controlled cure profiles that include high consolidation pressures and high curing temperatures have made them the gold standard for achieving top quality levels in high performance composites. However, autoclaves tend to be large, bulky and expensive to acquire and operate. The larger ones are difficult to move by road, take up substantial factory real estate and consume copious amounts of electricity, nitrogen inerting gas (to minimise fire danger) and other ancillaries. So, for some time there has been a quest for viable alternatives. 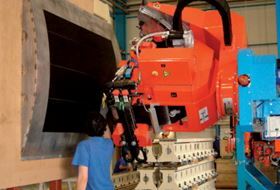 This search has intensified as the sizes of manufactured composite products have increased (witness aircraft wings and fuselages, wind turbine blades etc. 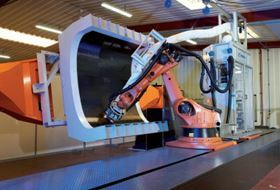 ), as items are produced in higher volumes and at higher rates (automobile parts for example), and overwhelmingly as determined efforts are made across all application sectors to reduce the costs of composite fabrication. In many instances, autoclave processing has simply become either impractical, too expensive or both – so much so that freedom from autoclaves has become something of a liberation theology. Examples show that progress is being made, even in applications where the highest quality levels are crucial. Nowhere is this more evident than in space, where structural challenges and the costs of failure are both enormous. A drive in lightweighting launch vehicles so that larger payloads can be carried is to produce their cryogenic fuel tanks in composite materials rather than metal. Reducing the costs of access to space in this way could prove to be a game changer, according to experts with NASA who hope for a 25% cost reduction along with a 30% weight reduction from such tanks compared with metal tanks used today. Composite cryogenic tanks are being specified for a number of rockets including NASA's own new heavy-lift Space Launch System and, intriguingly, a Falcon-1 class launcher being developed by youthful commercial enterprise Firefly Space Systems, which aims to reduce space access costs. Their affordable system has a novel aerospike engine fuelled by methane and oxygen which are stored in liquid form at cryogenic temperatures. In order to make the fuel tanks as light and strong as possible, as well as absolutely leak tight, they are fibre wound by Boeing, using polymer materials and processes not too dissimilar from those the airframer uses for the pressurised fuselages of its B787 commercial jets. However, to avoid the need for autoclaves large enough to house tanks several metres in diameter, Boeing migrated to an out-of autoclave (OOA) cure for a prototype tank it built for the Composite Cryogenic Technology Demonstration project in the USA. As a cost cutting and quality consistency measure it used automated fibre placement (AFP) to wind the tank, which at 5.5m diameter is one of the largest composite cryotanks so far built. An oven cure followed. The completed tank was this summer taken to NASA's Marshall Space Flight Center where it was successfully tested at temperatures down to −253°C. Vickers also quoted an Airbus assertion that 30% of the energy cost normally incurred in producing composite structure is due to the use of autoclaves. The space frontier further serves to illustrate the vital importance of material development to OOA processing. In particular, the state of the art in pre-impregnated materials is advancing fast, this material form being favoured for the high and consistent fibre volume fractions that it facilitates, with freedom from dry spots and resin rich areas that can occur with infusion, plus the fact that the structure fabricator does not have to master challenging impregnation processes since these become the province of the material manufacturer. A notable example is the MTM45-1 prepreg from Umeco's Advanced Composites Group (ACG), used as the material basis for the remarkable White Knight 2/Space Ship 2 aircraft/launcher combination produced by Scaled Composites for the Virgin Galactic space tourism venture. (NB: UK headquartered Umeco PLC was acquired by Cytec Industries Inc. in 2012). This novel air/space craft is claimed as the world's largest OOA cured aerospace structure, given the White Knight's 140ft wing span. Typical void content for the cured material, according to ACG, is less than half a percent, enabling it to compete with autoclave-cured competitors for quality.